How to bleach driftwood to create pale or white driftwood? Bleaching driftwood is the process of chemically altering the surface of the driftwood pieces, to change the colour of the driftwood. How to Bleach Driftwood – white driftwood – after being chemically bleached AND after some days of being naturally bleached while drying naturally in the sun outdoors. 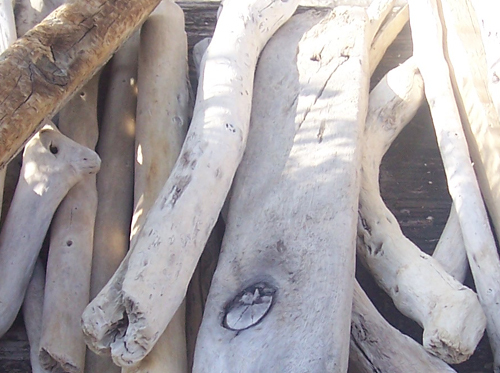 It is not true that all driftwood is pale, and almost white in appearance. Most driftwood is in actual fact very close to the original colour of the tree the driftwood comes from, which ranges between pale yellow and dark brown, or even dark red. To get that popular pale look, or to get white driftwood, you need to bleach driftwood. 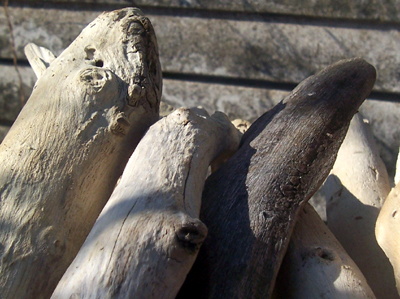 Although our cleaning process includes the use of a bleaching agent, this is not just to bleach driftwood, but is more for disinfecting purposes than for trying to bleach driftwood to lighten its colour. by soaking the driftwood pieces in a strong bleaching solution. We use swimming pool chlorine for this. 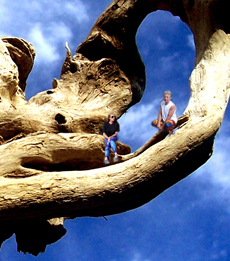 We do not usually bleach driftwood very harshly (for our own driftwood craft projects or for the pieces of driftwood that we sell, as the chemical process does adversely affect the surface of the wood. We also do not recommend that driftwood be bleached repeatedly. A single bleach with swimming pool chlorine is often all that is required to get the driftwood pieces considerably lighter in colour. The driftwood pieces are scrubbed or brushed, to remove loose matter. The wood is then sprayed down with a hose pipe, to remove sand and anything else that will come off. The wood is washed, in water with a laundry detergent or dish washing liquid, to remove light dirt and stains. The driftwood is rinsed thoroughly. The wood is then soaked in a bleaching solution. The desired lightened outcome for the wood will determine the strength of the solution, and the bleaching product we will use. For normal cleaning we will use ordinary household bleach, like Jik. This will disinfect the wood, and provide a minimal – almost imperceptible – colour change. We use about a 1 in 9 ratio of bleach to water, and leave the driftwood to soak for about half an hour, but this soaking time depends on the size and thickness of the wood. For white driftwood, or driftwood that is very pale in appearance we will use swimming pool chlorine instead of bleach or in addition to having first used bleach if doing a second bleaching later. We will use 1 tablespoon of chlorine in 15 litres of water, and will leave the driftwood pieces in this solution for about half an hour – again, this depends on the size and thickness of the wood. Although some folks do, we do not really recommend leaving any piece of wood in a chlorine solution for longer than 3 hours, or doing a second bleaching session once the wood is dry, as the chlorine may damage the surface of the wood. 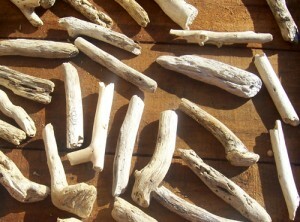 After bleaching the driftwood, the pieces are thoroughly rinsed off, by immersion and by using a hose pipe. The wood is then laid out on racks to dry naturally, out in the wind and sun. How to bleach driftwood – pieces bleach differently, depending on how thick the pieces of wood are, how porous they are, what type of wood they are, the ratio of the bleach or chlorine to water, the amount of days left in the sun, or what colour they were originally. The driftwood pieces will start displaying their new lighter colour as they dry, about 3 or 4 hours after being laid out in the sun to dry and air. 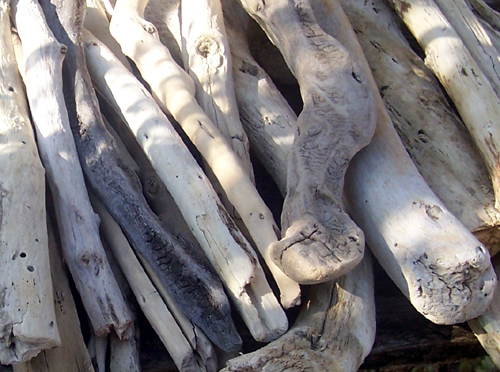 Leaving the driftwood pieces in the sun for several days can help lighten the pieces even more. Perhaps try this first to see if you’re happy with the lighter colour, before considering to put the pieces through a new chlorine bleaching solution for a second bleaching. Because of the many variables involved when one wants to bleach driftwood pieces, it is almost impossible to predict how light or white the newly bleached driftwood pieces will be. If you want white driftwood pieces the easy way, then paint your pieces white, just accepting that they won’t look naturally sun-dried white if you’ve painted them. DO NOT use bleached or chlorine bleached driftwood pieces in pet enclosures of any kind. DO NOT use bleached or chlorine bleached driftwood with any live plants. The chemicals or chlorine content may prove harmful to animals or plants. DO NOT mix chlorine with warm or hot water, as the resulting fumes may tighten your chest and make it difficult for you to breathe.